After the trunk show was over... we got to have some fun!!! Yay! Pattie, Meg and I all biked down to the Amsterdam Brewery to celebrate the new issue of Dandyhorse being published. We decided to grab some Nightshades gear at the last minute. It's kind of weird but awesome to feel like I'm in a totally colour co-ordinated photoshoot even when I'm just drinking some beers. Sunny D and Frank-Shade started dancing up a storm and then they raced on the stationary bikes. They had them hooked up to a laptop with a timer and a projecter so you could watch who was biking faster. Frank won cause he's so fit. Sunny was still in good spirits afterwards. Then Pattie and I raced. Pattie had a big advantage because of her aerodynamic racing suit, whereas my hood kept catching the wind. Pattie won, but everyone knew it wasn't a fair race. Anyways, I'm gonna go and lie down and read my new issue of Dandyhorse! You can pick them up at most bike stores around the city but go here for more info. my bike was stolen from my apartment last click here for more information and pictures of it. So here it is! 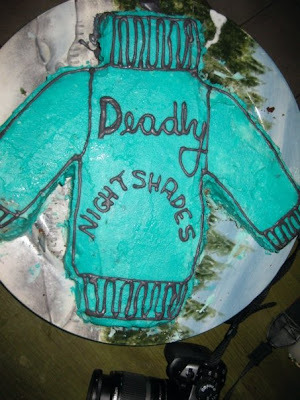 The very first Deadly Nightshades bike gear collection. 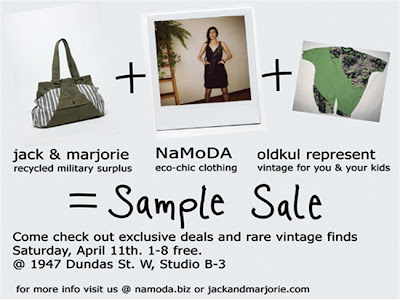 Hand dyed, hand printed and hand sewn, right here in Toronto by Cat Essiambre, Niamh McManus, Pattie Youn and I. It wasn't easy pulling together a cohesive collection with four very different, very opinionated designers but we started with a firm colour palette (seafoam, roe and grey) and the idea that everything should be wearable enough to go biking in but still look great. I'm actually really happy with the results and I want to wear pretty much everything in the collection. I'm especially excited to get myself into the seafoam tights with bike wheels printed all over them!!! There were some pieces that we all agreed should be included at the very beginning, like lots of cute, printed tights and jersey tops because they're so easy to bike in. Other pieces got added in later to keep things on trend, like the cape and the flouncy top. 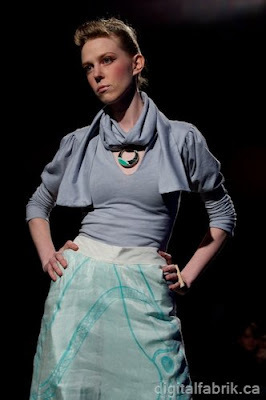 We tried to make everything as wearable and sustainable as we could, without sacrificing style or cute appeal. I love how happy Kealan looks in her organic twill johdpurs!!! If you'd like to come see the clothes or just hang out and chat about biking, babes or sustainability - we're having a trunk show on April 29th at 88 Nassau where you can pre-order clothing before it's even in stores!!! See you there! On a final note, one thing I love about [FAT] is that these “alternative” designers aren’t afraid to dress for all body types. A great deal of booty, bosom and bounce mixed freely amongst your average twiggy, tall types, and everyone seemed confident and ferocious. Terrific night, terrific event. Get out there and experience it yourself-there are still two days remaining!" Drunk in the Trunk Show!!! Get it Now - Before Everyone Else Does! 2. Hair Metal. It's also scientifically proven that listening to hair metal after a bender can help a hangover. Guns and Roses are especially full of amino acids that help your brain build new neurotransmitters that were lost the night before. 3. Drink a Cesar. Sure, you could drink water and rehydrate yourself but this is much better for you since there's so many vegetables in a Cesar! Ask water how many vitamins it has in it. If it could talk, it would say zero. That's right. Zero vitamins. Pfft. Water is SO over-rated. 4. Advil. Take two before you go to bed - once you wake up, it's too late. All of your braincells are probably dead anyways. 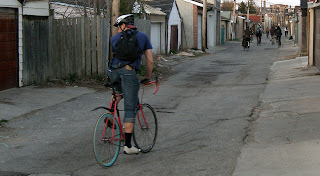 3rd.friday alley cat ride. starting point: bike pirates - around 40 cyclists cruised the city alleyways and parks, forcing innocent bystanders out of the way. especially children and puppies driving cars. also, bike pirates is awesome. thanks frank for the photoz. Both the NOW Magazine and EYE Weekly thought we were shout-out worthy, and have mentioned us in their own blurbs about Toronto Alternative Fashion Week. Some of my favorites for are Praise a Glass, because it's about alcohol. Reading Between the Labels is a great guide to the little images on the products you should buy. From the EYE, make sure you read: Meat Matters deals with the often touchy subject of meat and it's environmental impact. Don't want to give up meat? No problem, just make sure you eat less of it. (But they left out some other possible benefits of a veggie lifestyle.) Toxic Undercover tackles the crap that is in your beauty products, but how can you call something that has Formaldehyde in it a beauty product? I think it's shameful that the government allows these companies to sell the public this crap. However, it it the general public's responsibility to inform and protect themselves. Despite the fact we'll all be rather tired come next thursday... (you know with just a little insignificant fashion debut the night before...nothing really), BUT come join us for my art exhibit opening anyway! For a sneak peek of my new series.... go here! Have you gotten your tickets yet to [FAT]? To recap for ya'll, The Deadly Nightsahdes will be debuting our Fall 2009 Collection at Toronto Alternative Fashion Week's Planet day April 22nd. That day conveniently happens to be Earth Day! Planet - April 22nd looks at the current state of the globe, and showcases work which deals with fashion and art in relationship to the environment and sustainability. The theme questions how we can create a balance between progress and nature. 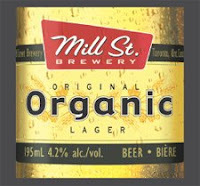 We will be partnering with Mill Street Brewery for our afterparty!!!! More details to come, just make sure you write it down in your callendar and PREPARE YOUR LIVER! 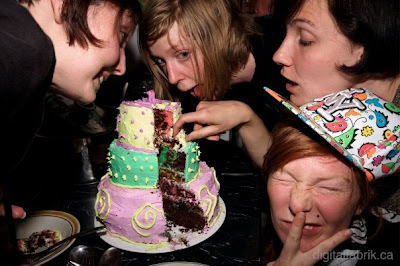 If i were to name one semi predictable thing about the nightshades, OTHER than our collective love of bikes, art, & the environment... it might just be our intense adoration for cake! example d: irene's last post...obviously. 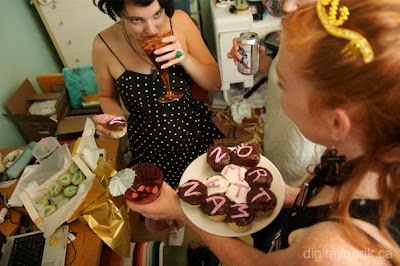 This love is probably the only good reason, my roommate and I spent and embarrassingly long time tonight, dying over the archives of an amazing blog... dedicated solely to cake wrecks! Or maybe it's just because today has been an exceptionally long day. Either way, the further back you go, the better the posts (More-disaster-less-ace-of-cakes). 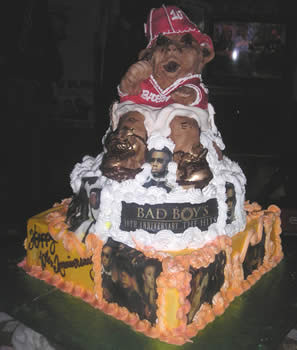 my birthday IS coming up again.... just sayin. HAPPY FIRST BIRTHDAY BUY THE POUND!! !